The PAT competency course will teach you how to identify the different classifications of electrical appliances in order to carry out the correct testing procedures. You will also cover basic electrical principles in connection with the subject. You will cover a combination of theory and practical exercises allowing you to practice what you have learnt on real everyday electrical items. If you have your own PAT Tester you can bring it along to the course and use if for your practicals. However there will be a number of models available on the course if you have not got your own pat tester. The PAT testing competency course is suitable for anyone who would like to know more about PAT Testing and get some practical guidance. The course is suitable for all industry sectors and focuses on how to PAT Testing portable electrical equipment. There are no prerequisites for this course. No prior knowledge is necessary. The IET Code Of Practice for In-service Inspection and Testing is a must for anyone who carries out PAT Testing. 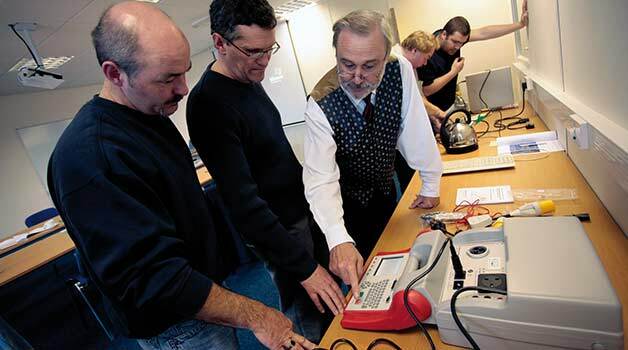 Learn How to PAT Test with the PAT Testing Competency Course in Reading. This PAT Testing Competency course is ideal for anyone who has the responsibility of organising and/or carrying out PAT Testing as part of your current job role or as a full time PAT Technician. The course covers both the practical and theoretical aspects of PAT Testing and will break down the subject into easy to follow modules. It will cover how PAT testing fits in with a wider electrical safety regime and you will conduct both a written and practical assessment to ensure you have understood the concept and feel confident once out in the field. This Reading PAT training course is ideally suited for anyone in the Reading area and is easily reached off the M4 and A33. Handbook of PAT Testing This book breaks down everything you need to know about PAT testing. RRP £19.99! Lunch and Refreshments You’ll break for your free lunch after the morning session. There’s also tea, coffee and juice available.